Not sure why olive oil is recommended as a healthy cooking ingredient? Read on to find out. All fats are dense in calories, but not all need to be shunned by those following a healthy eating plan. In fact, some fats — such as olive oil — are considered to be heart healthy. Why is this? The main type of fat found in all kinds of olive oil is called monounsaturated fatty acids (MUFAs), which are considered a healthy dietary fat. You may gain certain health benefits if your diet replaces saturated and trans fats with fats that are mostly unsaturated, such as MUFAs. Saturated fats are found in meat, high-fat dairy products, and tropical oils, such as palm-kernel oil. Fats that are "partially hydrogenated," including some types of margarine and shortening, contain trans fats. Trans fats are also found in processed foods like salad dressings, cookies, snacks and fried foods. By replacing the type of fat that you usually cook with — or spread on or pour over food — with olive oil, you’re making a good decision. "Monounsaturated fat such as olive oil helps lower your risk of heart disease by improving related risk factors," says Donald Hensrud, MD, an associate professor of preventive medicine and nutrition at Mayo Clinic and medical editor-in-chief of The Mayo Clinic Diet. "For instance, MUFAs have been found to lower your low-density-lipoprotein cholesterol levels when substituted for saturated or trans fats in your diet. And some research shows that MUFAs may also benefit insulin levels and blood-sugar control, which can be especially helpful if you have type 2 diabetes." 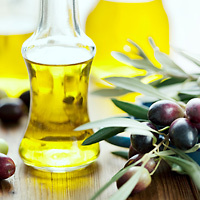 Just remember that even healthy fats, such as those in olive oil, are high in calories, so use them only in moderation. Choose MUFA-rich foods such as olive oil in place of other fatty foods — particularly butter and stick margarine — not in addition to them. Use olive oil conservatively to enhance the flavor of foods, such as roasted vegetables and stir-fries, or in marinades or dressings for salads. And remember that you can't make unhealthy foods healthier simply by adding olive oil to them.